1. Grind the onions in a mixer. 2. Combine the onion puree with olive oil, salt and pepper powder. 3. Marinate the lamb pieces in this for 1 hour in the fridge. 4. Cover with cling film and turn once or twice. 5. Thead the lamb pieces onto skewers. 6. 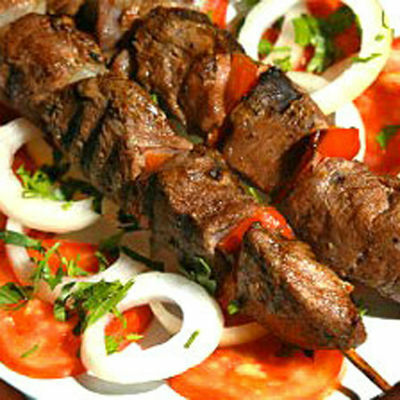 Place them on a charcoal grill and cook for 8 to 10 minutes till well browned on the outside but still pink and juicy inside..
Feel free to comment or share your thoughts on this Shish Kebab Recipe from Awesome Cuisine.